We welcome you to come discover the WOW Toyota of Wallingford difference. At WOW Toyota of Wallingford we pride ourselves in providing excellent customer service before and after the sale. We don’t just sell and service cars we make customers for life. This is why we are DealerRater Certified. We sell and service new, used, and certified Toyotas including the Toyota Yaris, Corolla, Prius, Camry, Avalon, Venza, Highlander, Rav4, Sienna,4Runner,Sequoia, Tacoma, and Tundra. We are a Connecticut Toyota dealer serving the Wallingford, Cheshire, Meriden, Hamden, North Haven, and Durham areas. We are only a short drive from Hartford, Middletown, Southington, Bristol, Old Saybrook and Woodbridge. WOW Toyota of Wallingford is proud to serve Wallingford, Bristol, Middletown & Woodbridge with quality Toyota vehicles. With models like the 4Runner, Camry, Highlander, Rav4, Yaris, and Sienna, we have something for every taste and need. Come visit us at 859 N Colony Rd (Rt. 5), Wallingford, CT 06492 to see our vehicles and take one for a test drive. If you’re looking for a used car in Wallingford, we can assist you there as well. Visit our inventory page to see our large collection of pre-owned vehicles. 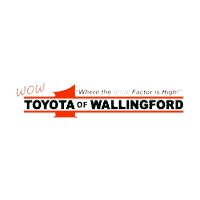 WOW Toyota of Wallingford is not just your Wallingford Toyota dealership serving the Woodbridge, New Haven, Bristol and Middletown areas, we also provide a full line of services dedicated to our Connecticut customers. From Toyota car repairs performed by expert mechanics, to OEM Toyota auto parts, to car loans, WOW Toyota of Wallingford is the smart choice for your automotive needs. Come in and say hi! We’re located at 8859 N Colony Rd, Wallingford, CT 06492 or you can call us at 888-927-7559. If you are looking for a Toyota dealership serving New Haven, Middletown, or Hartford, we are your destination. We are only a short drive for anyone looking for a Toyota near the Greater Hartford and New Haven area. We look forward to meeting you and helping you get into the right car, truck, or SUV! At WOW Toyota of Wallingford, we don’t just sell and service new and pre-owned vehicles, we make Friends for Life. Our philosophy has always been that the customer’s experience is the most important thing that happens in our dealership. Being a Signature dealership and consistently focusing on improving dealership process to enhance the customer experience is what all WOW Toyota of Wallingford employees believe in and contribute to.